policy to cover your needs. 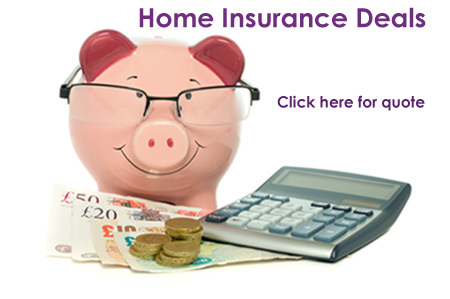 Get the best deal on your home insurance. Building Insurance covers the structure of the house as well as such permanent fixtures as kitchens, bathrooms and fireplaces. It covers fire and flood, subsidence, storm damage, falling trees and burst pipes. It also covers third party claims and legal fees. As with most insurance policies, there will be exclusions so be sure to read the small print. Remember, it is 'small print' for a purpose. Most people can't be bothered to read through the often archaic writing and are shocked when they find their claim is not covered. Take time to read and don't be caught out. Buildings insurance needs to cover the total rebuild cost of your home. This is usually less than the market value of the property. Contents insurance premiums vary enormously depending on the type of cover you require. New for old and accidental damage are obviously going to be more expensive. Don't underestimate the value of your contents as any claim would be affected. The additional option of personal insurance for named items that are used outside the home can be added to the policy for an additional charge. There are special policies for students while they are away from home. These may or may not cover bicycles so, as always, check for exclusions. Whatever your requirements, we at Money Discount Centre will make your search for the best product a less onerous task.